U.S. private equity firms collectively raised $462 billion in 2018. While this is considerably less than the $695 billion raised in 2017, it is still a significant increase over 2015 and 2016. The chart below shows how the $462 billion in 2018 fund raises were distributed by size. As previously reported, the median fund was $30 million. How does this compare to previous years? In almost every range, 2018 private equity fund raising exceeded prior years. So how is it that 2017 raised so much more capital in total? This is because 2017 had some very large funds on the far right. 2017 had 22 individual funds that raised more than $5 billion each and 36 funds between $2 – $5 billion. It takes a lot of the smaller funds to make up for this difference. 2017 was therefore more heavily invested in the largest funds while 2018 had considerably more individual funds, but each smaller in size. The money is moving down market. 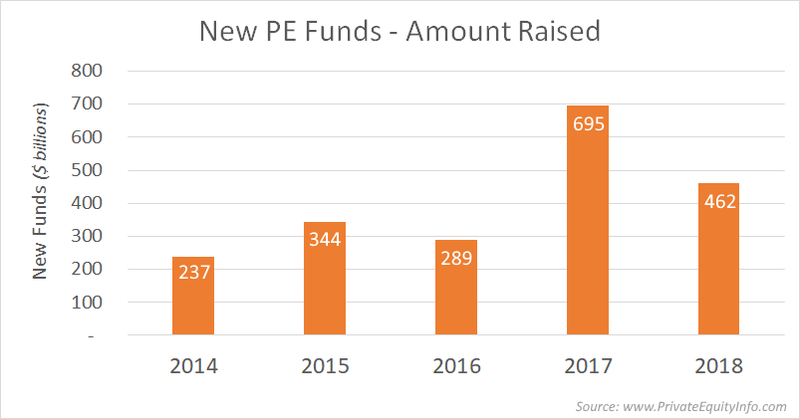 This fund-raising trend is consistent with other evidence we see of this in the marketplace… that of private equity funds moving toward smaller deals in the mid-market and lower middle market. © 2004-2019 PEI Services Ltd. All Rights Reserved.